Hi everyone and Happy Friday to you! Jen here today to host the blog. I have a cute card to share with you today. 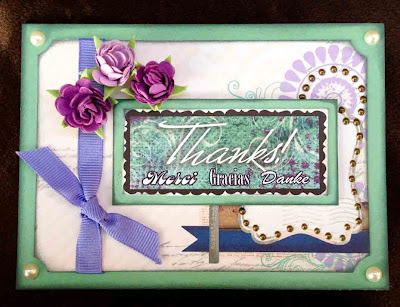 It seems like I use a ton of “Thank You” cards, so it never hurts to have plenty on hand! I made this one using the Dusty Road 6x6 Paper Pad. I layered two different patterns onto my card base and inked the edges with Coal Miner PowderPuff Chalking Ink. of the card. I then add dots of copper paint around the designs on the patterned paper. I like how you used the copper paint on the patterned paper. Pretty card!! Love the copper paint you added! 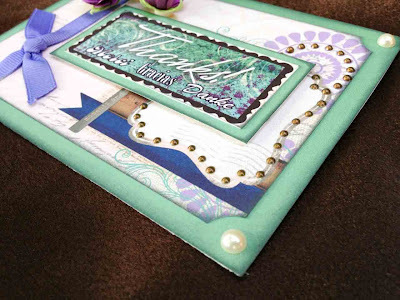 Beautiful card Jen! I LOVE the pop of purple!